When the WildStar servers go down, I tend to play SMITE. As far as MOBA’s are concerned, I really dislike DOTA 2 and League of Legends, primarily because the control system seems so at odds with such a twitchy game. SMITE might be a little rough around the edges (though its come on leaps and bounds since Beta) and it might lack the art direction consistency of its rivals, but it’s actually a lot of fun. Although it’s burdened somewhat by the genres limitations on movement (you can barely jump and you run at a snails pace when attacking), from a combat perspective it actually shares certain similarities with WildStar: telegraphs and the need to aim everything. That’s probably where the similarities end but playing SMITE did get me thinking about the MOBA possibilities in WildStar and how a PvP battleground based on this principle would be a marvelous addition. Although SMITE adheres to the typical 3 lane MOBA setup in its Conquest mode, it’s the Arena matches which I would find most fitting for WildStar’s playstyle. In SMITE’s Arena matches two teams of 5 are placed into an oval arena. There are two “bases” for each team at either end and entering this space replenishes your health and mana. Spawning from your base are minions which work their way across the arena (automatically) with the intention of entering the opposing teams portal. If your minions successfully enter the portal, they’ll deduct points from the opposing team (each team starts with 500). On top of this killing the opposing team reduces their points total quite significantly, so arena matches become a real tug of war to not only kill each other and avoid being killed but to also feed your minions in the portals. It’s fast, very aggressive and leads to some brilliant fights. Throw in some NPC’s on either side which provide temporary power-ups and you’ve a recipe for a very competitive match. Although MOBA’s typically have much more reduced skill sets than WildStar (around 4 to 5 skills) I don’t believe there would have to be many changes in this department. 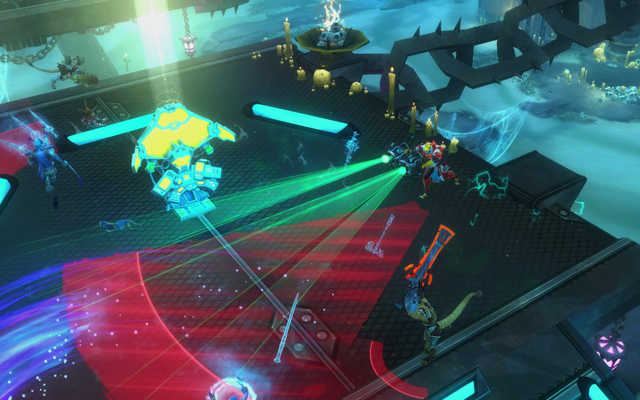 WildStar already has a limited action set and already operates Team Arena on a 5v5 setup. The biggest adaptation needed would be itemisation, XP and gold acquisition. For anyone unaware, in a MOBA you kill opposing players and minions to earn experience points and gold. You use your experience to level up your skills (which increases their effects) and you use your gold to buy items, which improve your heroes power or utility. Remove all items from players entering the arena so they go in with only their base attributes and implement existing game items, armor and gadgets players can buy over the course of the match to spend their “gold” on. Create four new skills for each of the classes, similar to how Guild Wars 2 manages its holiday events. Alternatively and if the above was too difficult to implement, remove the need to purchase and upgrade items for players and instead have it so you and your team purchase items to improve the strength of your minions. Players would need to fight over the creatures protecting power-ups. Players would need to fight each other, but also prevent minions from entering their portal. Players would need to quickly earn gold to improve their minions if they’re to tip the balance in their favor. Admittedly there would be a lot of work needed by Carbine to make this mode work, but ArenaNet have successfully adapted game modes with unique skills and mechanics in Guild Wars 2 (see Southsun Survival or Aspect Arena), so it certainly isn’t outside the realms of possibility. 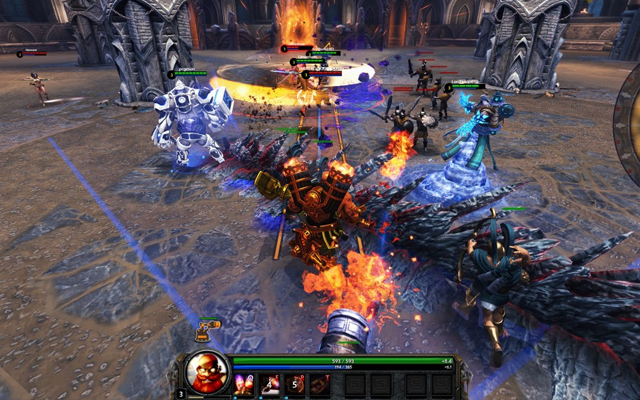 The biggest obstacle is deciding as to how much you allow the MOBA influences to creep in. I think a combination of allowing players to itemize throughout the course of the match and to create a greater emphasis on minions would be a much stronger pairing. Perhaps it’s just me but to some degree I’m sick to death of the typical King Of The Hill or the Capture The Flag game modes. A hybridized MOBA in WildStar, in a Battleground setting, might just be something the genre needs.